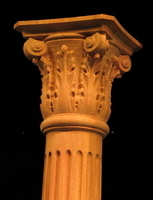 Whether incorporated into decorative mantle surrounds or trimming wood doorways and window casings, carved wood columns and pilasters (flat edged columns) are the most classic component in decorative architecture. Many shown with optional Capitals. All carved wood columns and pilasters feature digitally created decorative art and can therefor be sized and custom carved to order to suit your requirements. Carved corner posts for application in kitchen islands, bars and other built in furnishings where an ornamented corner is required. Carved columns are one of truly classic architectural components and Heartwood Carving is capable of providing our collection of round styles in full, 3/4 for corner applications or half forms in a range of sizes that can be tailored to suit your particular requirements.